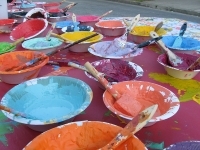 For more than 20 years, the SoWeBo Arts Festival has been held every Sunday of the Memorial Day weekend. Coined a 'Topsy Turvy Excursion into Art and Music', the festival presents Baltimore's largest music venue (40 + bands), a sizeable non-juried art exhibit, puppet shows, glass blowing demos, outdoor sculpture, kid's art and fun. The aim is to 'foster community development through the promotion of art and music', by showcasing the talents of neighborhood artist, musicians, and working professionals. The festival has grown to incorporate various arts events throughout the year, with concerts and exhibitions held at galleries and other venues around Baltimore, though the flagship Sowebohemian Arts Festival is still held in May.